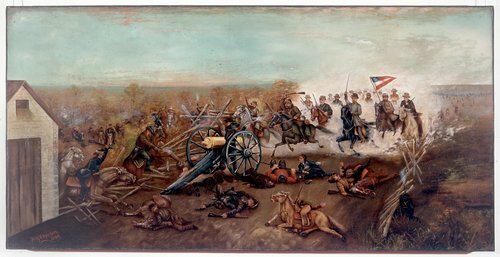 This painting depicts the Battle of Byram's Ford (a.k.a. Battle of the Big Blue), which took place on October 22, 1864, in Jackson County, Missouri. During the battle, the 2nd Regiment of the Kansas State Militia, which was aided by the Topeka Battery of Artillery, fought the Confederate forces of Sterling Price. Captain Ross Burns commanded that artillery battery. Ross may have commissioned artist Benjamin Mileham to execute this painting. Mrs. Ross Burns later donated it the Shawnee County Commissioners and the Grand Army of Republic in memory of her then deceased husband.